Improves the thermal behaviour of the building and saves electricity consumption. High thermal insulation efficiency, which does not change with time. 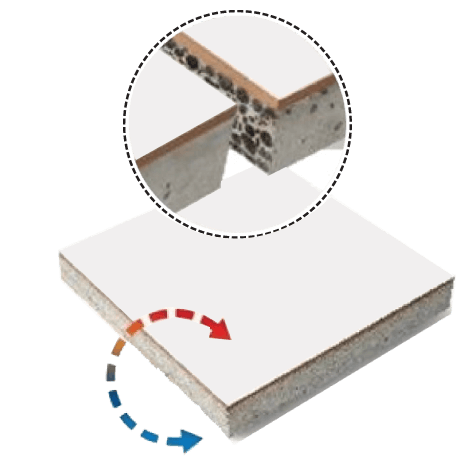 Protects from thermal cycling effects and increases the building life. Easy application and maintainence free. Same as conventional ceramic tile laying technique with 4-5 mm groove between tiles. P.S. Waterproofing is must before laying the tiles. After setting of Expanded Clay Aggregate (ECA) Tile, fill the joints by mixture of fine sand + normal cement mortar or any other cementitious material. Dimension 300 mm X 300 mm X 40 mm app. Unit Weight 3.5 – 4 kgs app.